I guess it is all my own fault. Who else is there to blame? 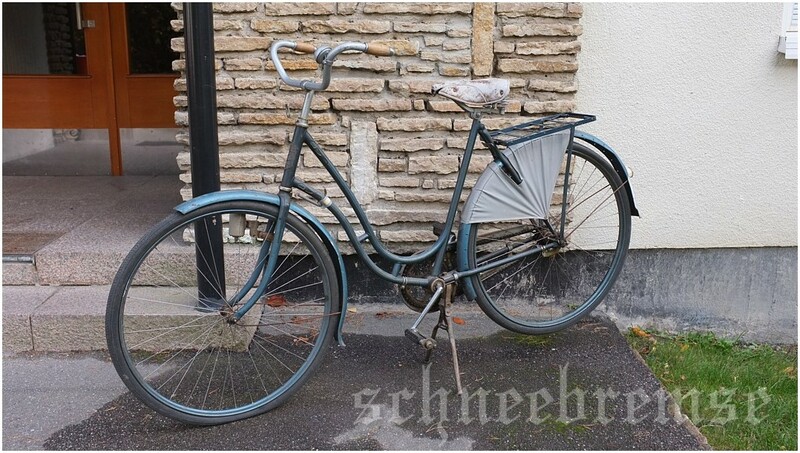 I saw an ad for an Swedish made Ridax bicycle that was made by A. Ekström in Hallsberg back in 1940´s. My first thought was that I do not need one more project in my already cramped basement. Especially when the seller wrote in the ad that some parts were missing. Parts like the saddle, chain guard, pedals, rear baggage rack, kick stand. But when I saw the photos the seller had posted, there was something with the bicycle that was really striking a note with me. Perhaps it was the decorations on the frame, the red colour with black and gold details. Or was it the 1940s design of the frame? After meeting the seller I went home with one more bicycle. Since there was no saddle or pedals on the bicycle I had to walk home. Along the way I got to know the new project quite well. The bicycle had most likely been involved in a accident. The handlebar stem was crooked, the front wheel was changed to a modern one. The rear wheel was badly warped. It rear wheel so bad that the rear tire had been grinding against the frame, rubbing away all the rubber from the tire at one spot. It was only a question of time before the tire would puncture beyond repair. When got home I decided to mount a head light and a dynamo, a worn chain guard and a set of pedals I had in a drawer, just to try it out. I borrowed a saddle from one bicycle just to get the look. It all looked great! Pedals and chain guard was not a big problem, those parts are common. Added chain guard, saddle, headlight, pedals and a dynamo. It looks quite nice. But what to do with the wheels? The rear wheel was original with an Torpedo hub from 1942. To find an original front wheel with the same colour scheme is impossible. After I removed the tire to inspect the rim I found that it was not only warped, it was rusty and had some cracks. I needed new wheels. I was offered to buy a set of stainless steel wheels from 1950’s from a shop in the city. The hubs on those where also Torpedo, but the rear one was the beautiful Zweigang model from 1953. Sadly with out the shifter or linkage to the hub. But I bought then. After all, they were all chrome and together with brand new grey Duro tired they looks amazing together with the red bicycle frame. Now the fun part of taking down the bicycle to pieces to could start. Clean, inspect and polish all parts before putting it all together again. Also to find the parts that are missing. I got an old bicycle from a co-worker some time ago. The reason why is simply that I was talking about an event in Stockholm called “Bike in Tweed”. There is an “Tweed run” in London that has become an regular yearly event, people dressing up in vintage clothes (often tweed) and on vintage bicycles are doing a parade around London. That idea has become a huge success so many other city’s have done similar events. For example in Helsinki / Finland the have the parade in the winter time. For anyone interested, just do a interweb search for “tweed run” or “bike in tweed”. Lots of great photos of lovely clothes and bicycles. Back to the bicycle. It was the co-workers mothers bicycle. She dont use it any more so she was glad to get rid of it. I am not 100% sure of the personal history of it. I will do some research. But the bicycle itself is a old Swedish one. It is a Hellas made by Fagergren and Johnson in the southern town of Kalmar. A approximately way to date the bicycle is to look at the rear hub. 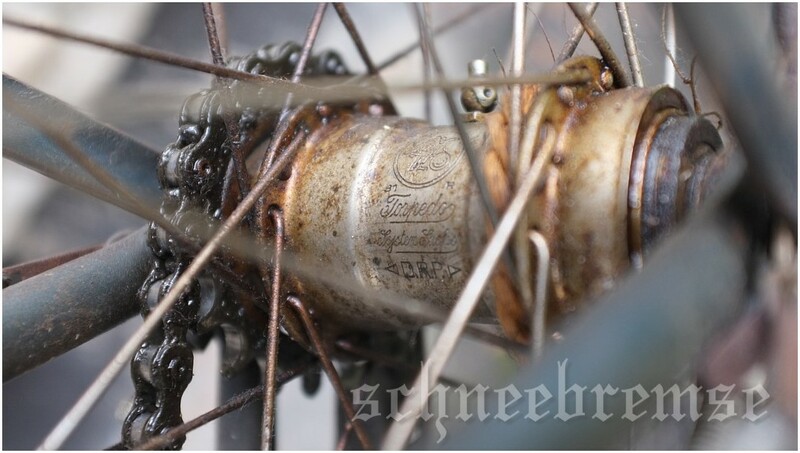 Almost every Swedish made bicycle in the years 1925 up to 1960’s used the German Torpedo hub. Those hubs are stamped with the last two digits of the year. That gives you an roughly date, add a couple of years and you are in the ballpark. Add the details of the bicycle, such as frame paint and other small details. So with all that in mind I can say that the bicycles hub is made 1931 and the frame has the details of late 1920 and early 1930’s. Today I started to take it apart to check on details and do some cleaning. I must say, its is in very good shape for its age. Hardly no rust, some dents on the mudguards. The handlebars are repainted many years ago. The handles are stuck, but that is not a big deal. After all there was many different versions and styles of handlebars at that time. Also the most popular handles where so called black “Rambler” handles. The saddle is most likely in a to bad shape after all exposure of weather and wind. But I dont think anyone will blame me for getting a new “aged” Brooks saddle in a vintage look. As for the handlebars, I might be able to find a better used one. Rambler handles does surface on auctions and so on from time to time. I might ask my connections in England to help out on that one. I will wash, clean the frame and mudguards. Take apart the hubs and clean them out, re lubricate them (I have grease from the 50’s so even that will be vintage). I have 11 months to complete the bicycle. It will be in the “Bike in tweed 2014”. There is all reddy a person that want to use the old bicycle all dressed up in vintage clothes. If it all turns out well, a photo will be taken of them two for the Schneebremse blog readers. I will keep you all updated on how it all turns out.